They're Selling Soda Pop, Aren't They? I don't know if this link to the recent Orangina ad will be viewable in the U.S. but give it a try. It is totally bizarre. The French creators are pretty proud of it. In the United States, for the majority of home dwellers, the delivery of mail happens far from their actual dwelling. 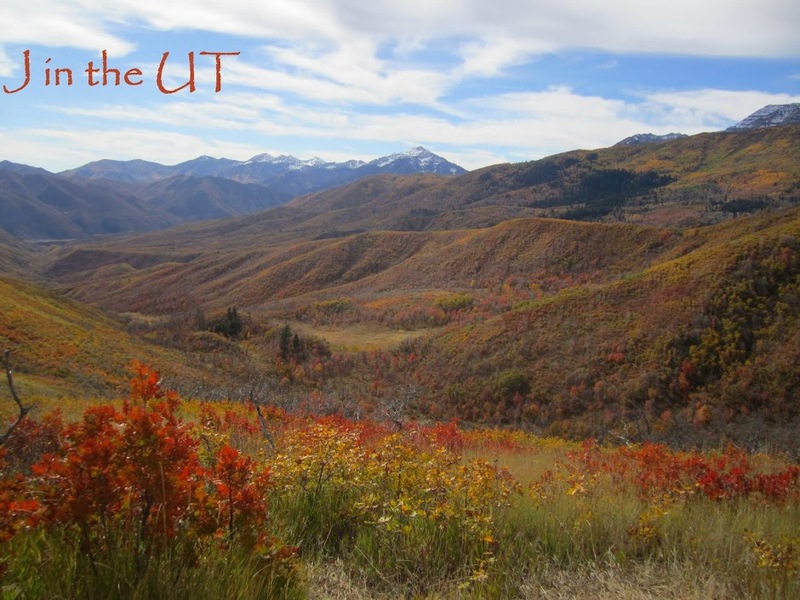 How many times have you experienced the fruitless effort of walking to the mailbox only to find that the mail had not yet arrived? Well here, we have a mail slot in the front door, so on Saturday mornings, when I am quietly enjoying my first cup of coffee of the day, mail comes flying in as the slot snaps shut. It is very jarring and I jump unexpectedly every time. I was telling my co-workers this and they had a good laugh. The other really weird thing that I learned this week is the mail only gets delivered to one’s home here. There is no pick up service. You have to go to a community mailbox to send your mail. So the Royal Mail delivers it, but to send it you have to go to a place called the Post Office if it can’t fit in the community mailbox for pickup. We have been receiving mail for the owner of the house that we are renting and have been given a forwarding address. I put a stack of it on the porch thinking the mailman would take it with him and it was still sitting there the next day. 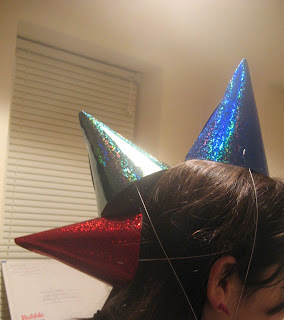 Again, my co-workers thought this was funny. I told them that the postman must think the folks at number 63 are nuts, since there is mail sitting on porch. One of them added, “Especially since they hear screams on Saturday morning when they stick the mail through the slot”. Oh, the silly American amuses them once again. I was recently asked by someone here if I carried a gun when I lived in the U.S. which made me laugh out loud. H has been spending his time taking back the uniforms that we had bought for the school we thought A would be attending, and buying the new uniforms. In some ways, this school is less strict on the uniform, by not dictating the color of the shoes, coats, and bags. However, this school states that hair must not be colored and must be worn neat, preferably pulled back in a black or navy blue ponytail holder. When H read this aloud to her, there was a huge sigh as A stomped out the room exclaiming that they were trying to take the fun out of everything! We laughed of course. I have to remind her that I used to have to wear a brown plaid pleated skirt and a blouse the color of nicotine stained teeth as a uniform, and then she has no comeback. 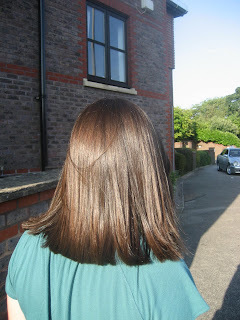 Since she had to have the light ends of her hair cut off, she decided to get a lot cut off to make the “neat” part easier. When American politics is taking an interesting turn, it is a bit hard being out of the country. On one of the morning shows here, an American journalist who is based in London said a recent poll revealed that Brits would vote for Obama 5 to 1. His life experience makes him more of an international figure which makes the world a lot more excited about watching this race. I was asked by a friend here who caught some of the Democratic National Convention, particularly Michelle Obama’s speech, what I thought of her giving a speech. This person thought that the Brits who are a lot more cynical than we are would think that was all just a big show and it would really annoy them. I told them that first of all it’s part of the game. Every politician in the U.S. must do these things, including trying to paint the picture of a perfect first family. I also said that Americans also are cynical about that, especially when you look at the recent John Edwards situation. But I do think that most Americans (like me) like to have a cheerleader in front of them every once in awhile. Part of our culture, whether some would argue it is a myth, is the idea of the American Dream. We like to feel like anything is possible. After discussing this with my friend, I didn’t realize how unique that perspective is. In our heart of hearts, we know one man can't fix it all, but also in our heart of hearts, we don't want to give up that glimmer of hope that he might. This was water cooler talk after the Olympics. We are now officially parents of a teenager. Yikes! We plan to spend the evening watching episodes of the new season of Project Runway, our favorite show that is NOT broadcast in the UK. Our buddy M sent several episodes last week and we thought we would save it for a special occasion. Thanks so much M! We couldn’t live without our Project Runway! This Monday is a holiday. Due to a cold, it’s been a very low key weekend, watching movies and the Reading and Leads Festival coverage on the television as well as the Olympics Closing Ceremony. The Leona Lewis/Jimmy Page segment reminded me of an American Super Bowl Halftime Show. No one here seems very excited about the Olympics coming to London. They seem more annoyed. You know that it is possible to find endless amounts of things to worry about if you let yourself. Saturday morning I woke up to a letter delivered by the post that notified us that A now has a place at the local all-girls grammar school, which we had been told would not happen this year although she did extremely well on the test. I was thrilled when I read it and ran upstairs to wake up H. Then of course my mind wandered to the hellish experience of buying her uniforms and how we would have to return all of that and start over buying different uniforms, and the $200 I just spend on PE uniforms for the other school with her name embroidered on them (recommended by the school) that now the store probably wouldn’t take back. That is a minor worry compared to the other worries that plagued my mind as the day went on. Will she apply herself and do well at this school or will she decide it is too hard and turn off her brain? Will she be going to school with a bunch of rich kids and feel like a total outcast? Maybe it’s just me but give an idea a long enough period of time to germinate in my brain and I can come up with a list of negatives in no time! So today is a new day, and instead of worrying, I’m going to feel very excited that she has this awesome opportunity. She is excited about it, so I need to just stop worrying. I have been taking a different bus in the mornings to get to work. I have two choices, I can sleep in a little longer and take the number 4 which requires me to walk to a bus stop further away or I can not sleep as long and pick up the 375 which stops just down the street. The 375 takes a windier way to work and every day when we get to this one road, where there is just one narrow lane going in both directions, and people parked in one of those lanes on the left, the bus ends up playing chicken with a car coming at us until the car basically gives in, pulling into a parking spot on the left or putting it into reverse and backing all the way out. At that moment, roads in England seem insane to me. Why would a bus go down such a narrow road? When I am coming home in the evenings I sometimes take this bus home where a woman, the bus driver’s girlfriend or wife, stands next to him every day as he drives his route. I was telling someone at work about it and since she is an optimistic person, her response was, “How romantic!” I told her that yes, I thought that at first, but then I started wondering, is he one of those controlling men that won’t let her out of his sight and that’s why she is there? He is a large man, and I can’t tell what language he speaks to her but it is a very harsh sounding language, so maybe that makes me think something sinister is happening. My work colleague, suddenly not being very optimistic said that maybe SHE was the controlling one and stood there where each woman entering the bus had to buy their ticket to make sure he didn’t stray. Who really knows but it is funny how we construct tales about perfect strangers. With entertainment like that, I have not felt super motivated to get a car. I had the great opportunity of covering Reading Festival this weekend for a website and it is a dream gig for someone who likes music. We really have nothing comparable in size to Reading Festival in the U.S. After looking over the public transport options, there was just no way to get to and from in an easy fashion each day and there was no way I was camping there, especially alone. I was upset about this and told H that if we had a car this wouldn’t be an issue. He of course told me that we shouldn’t rush into buying a car that day just because I had an impulse. So true. We are just beginning our car research and were planning some looking this weekend. I’ll just be watching the Reading coverage on the telly and watching the drama on the bus a little longer. All Birminghams Look the Same, Right? My buddy KH in St. Louis sent me this article. Thanks! 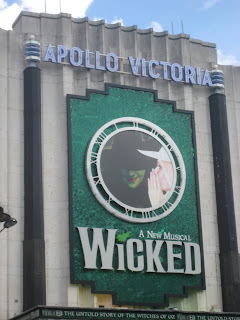 As an early birthday present I took A yesterday to a matinee of Wicked in London. We saw it a few years ago in Chicago with our good friends L and Mel, so I wasn’t totally excited about seeing it. A couldn’t wait. I was pleasantly surprised that I enjoyed it more than I expected. The actress who played Elpheba was absolutely amazing. It’s the first time I’ve been to a matinee performance and that was nice as well. There was a more relaxed feel than when you go in the evenings. It was an excellent afternoon. A didn’t realize this but I got a bit emotional during the play because I feel the summer slipping away from us. School starts in two weeks and I can tell she is so nervous about it and I’m starting to feel really bad about putting her through this. She cried this week because school started in St. Louis and she is missing her friends. Life seems to be moving fast when it comes to her growing up. Thirteen is only two weeks away! On a lighter note, I can tell she’s becoming a teenager because I took her picture outside the theatre and when looking at it, her first comment was “Oh my God I look so fat”. 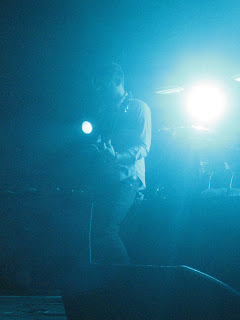 When I lived in St. Louis K and I would sometimes cover live shows for a music magazine’s website in exchange for tickets to the show. I told H the first time we got to do this, “Free concert tickets…it might be a sign of low expectations for myself, but I can now die having met all my goals”. So last night I was back in the zone as I made my way down to Brixton which is south of the Thames to cover a Kings of Leon concert at the Carling Academy. I was looking forward to it but was also nervous because I was solo, without my partner in crime. The security guy in the photographer’s pit in front of the stage, who looked mean as hell turned out to be the only gentleman in the crowd. He took pity on me and helped me get some great shots. All the other photographers had backpacks full of expensive equipment and all I had was my Canon PowerShot! My friend C’s boyfriend jokingly calls the upscale grocery store Whole Foods, Whole Paychecks because of the high prices. We were in Kensington on Saturday and decided to stop in the Whole Foods there, the only one in London. 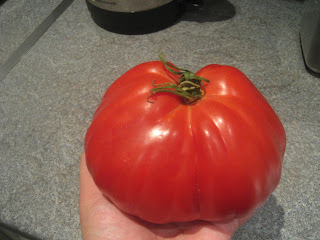 Call me nostalgic for Southern summer days but I felt the need to buy this beautiful tomato imported from France on Saturday. In our American offices, whether you grow them yourself, or a co-worker supplies them, homegrown tomatoes are common and I do miss them. When we got up to the register and saw that after weighing the damn thing we were paying about £4.15 for one tomato, H and I couldn’t look at each other for laughing about it. The tomato was incorporated into both Sunday lunch and dinner so it didn’t go to waste but it really was flavorless. Sigh. 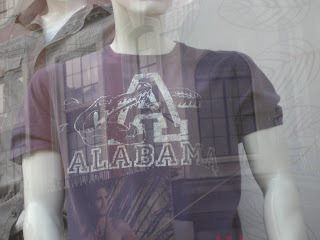 I spotted this t-shirt in a store window in London last week and had to take a picture. Is this not a mixed message, a gator wrapped around the Alabama "A"? A tells me that she is going to try very hard to keep her American accent. She won’t let me record her voice now so I can compare it to her accent when we leave the UK. I have a feeling it will change. 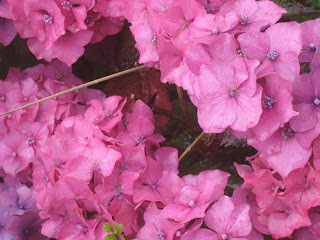 This week we were taking a walk and I stopped to take a picture of a neighbor’s hydrangeas pictured here. She said to me, “What if the neighbor looks out the window and yells ‘Oi! 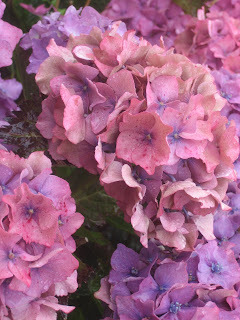 What are you doing taking pictures of my garden!’” Keep your accent sure. A month in and she’s already using ‘Oi!’ It’s just a matter of time before she sounds un-American. Hard to believe but today it is officially one year since I made the move to England. Thanks to all the readers for cheering me on along the way. 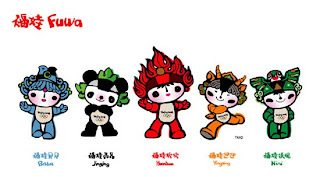 I am very interested to watch the BBC coverage of the Olympics to see how different it might be. I wonder if some of the commentators will feel the need to fill up quiet moments as some of the U.S. commentators do. The result is a "Best in Show" moment when someone like John Tesh is covering gymnastics on NBC. I've got the BBC on this morning and the commentators have said that the swimming schedule was moved around because American television, which has a lot of pull with the Olympic committe, wanted Michael Phelps' race to be timed for primetime American television. I will be interested to know if that fact makes it to the U.S. coverage. Watercooler conversation on Friday drifted to the 2012 Games in London. How will the London transport system handle the event? There are a lot of doubts that it can. H has been doing the online shopping but this past week after he made the list I told him that I would go online and place the order. After the groceries were delivered, he asked me, “Did you mean to buy one banana?” No, I didn’t and it looked so pitiful, one banana with a big weight/price tag on it. I remember when I was placing the order for bananas it asked for the amount of bananas I wanted by kg. I thought I would trust the Tesco website to figure out that I wanted a “bunch”. As Carol says on Little Britain, “Computer says no”. Hard to believe that A. will start school in less than a month now (September 3rd). She will need a proper school uniform plus a “PE Kit”. I discussed this list with the next door neighbor who has had three kids at A’s soon to be school to make sure that she really needed everything on the list. I also asked, can she really only wear a black jacket/coat and carry a black bag and the answer was yes. The neighbor was telling me not to worry about buying “football boots”. I thought I would google that later because I have no idea what a football boot is so there is no chance I might intentionally buy them. Here’s what the uniform list looks like. The only thing that makes A. happy about it is that it is mostly black. One small, plain stud in each ear-lobe. No other piercings are permitted. Well, it looks like since 11:00pm Monday night UK time a successful transaction was made in the Chicago area thanks to my buddy Mel and our last big possession in the U.S., my leased Beetle, is now no longer mine. She is mailing me the papers today so I can sign them and send them back and then as they say in England, it will be done and dusted. It has been a long process getting rid of this car. When we were home in the States I think I spent about two hours a day between phone calls and various office visits to get it sorted and it still wasn’t done before we left. It was like having a very sharp pebble in your shoe and not being able to stop and shake it out. Over and over again I felt like I was being taught a lesson by the universe. 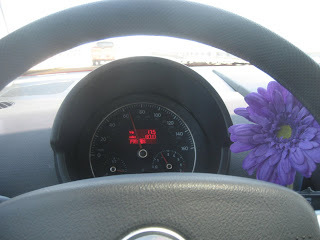 While I adored my car, I bought it when I had a perfectly fine car to drive just because I was having a very low point at work. Oh well, moving on! Once the paperwork is returned, it will be time to shop for a car here, which I am absolutely dreading! "Prepare Yourself for a Stampede of Teenage Girls"
A. has been a little depressed since coming back to the UK and missing the constant communication the telephone in the U.S. brings to her friends. 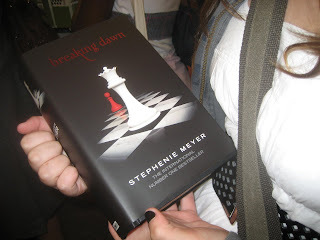 So I took a vacation day today so we could go to London for the 8:00am release of the latest book in the Twilight series, Breaking Dawn by Stephenie Meyer. If you haven’t heard of these books, they have reached Harry Potter-level popularity, but mostly with teenage girls. We left the house at 5:30am for our brisk twenty minute walk to the tube station. Is it really August because I could see my breath this morning? 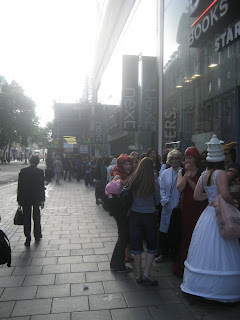 We arrived in front of the Oxford Street Borders store at about 7:15am to stand in line with lots of other girls, some in costume. Some people passing on the street asked what we were waiting for. 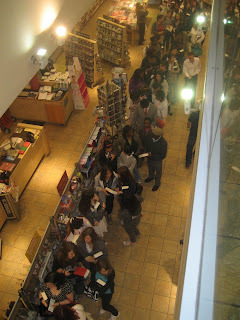 When the doors opened A. got practically trampled trying to get a copy and stand in line. 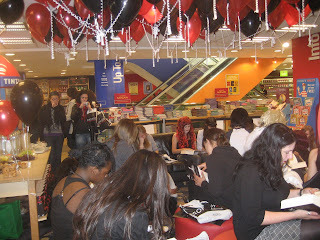 We then went up to the second floor of the bookstore for Breaking Dawn related events all of the girls were piled on the sofas with their faces buried in their newly acquired copies. I’ve never seen a group read like that before. A. was waiting to start reading hers until we got home. Of course once we got on the train home, she couldn't resist reading a few twenty pages. This is not a good picture with the utility pole in the way, but it was all I could quickly take as I was waiting for the bus on Friday morning. 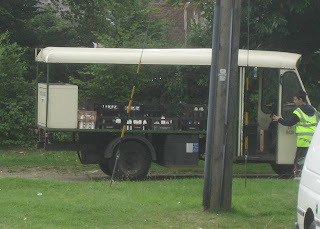 Here's a picture of the milk delivery. We don’t go out to dinner often at all here. It is way more expensive than in the U.S. where going out to dinner is a way of life. A few weeks ago we went to one of the pizza chains in the UK and we each had one drink (non-alcoholic) and then individual style pizza and the bill was the equivalent of about $66.00. Last week while in Chicago we picked up a carry-out pizza from one of the great local places and it fed all four of us and we had leftovers for $25.00. That’s fine though because we need to eat at home more than we did in the U.S.
All the grocery store chains in the UK have at least two aisles devoted to heat and eat stuff that ranges from chili con carne and rice to fancy meat and veggie dishes. All of the packaging says things like “good as going to a restaurant”. So is the amount of packaged food directly linked to the cost of going out to eat here? It seems to be since they both offer convenience. The packaged stuff seems very expensive to us but it does pale in comparison to going out for a meal. We went out to an Italian restaurant on Thursday for dinner. To be healthy I ordered a beautiful salmon salad that had greens, asparagus, green beans and some cherry tomato underneath. It was beautiful, but it was so healthy and not so filling that I felt like a vulture staring at A’s quattro formaggi pizza, waiting for her to say that she was done so I could have a piece. She did offer me a piece since this particular restaurant used gorgonzola as one of the “formaggi”, which is not her cup of tea. Still trying to eat healthy, but right now it is not easy.